The Toyota Camry and Toyota Corolla are two of the most popular cars in the United States, with each accounting for a large share of sales in its own market segment. The Camry is Toyota’s midsize sedan, while the Corolla is Toyota’s player in the compact sedan segmen. But is it better to go small and cheap with the Corolla, or to spend more money on more space with the Camry? Here’s how these two Toyota sedans stack up. The Camry offers a wider range of available tech features than the Corolla, which is to be expected for a higher-end model. Toyota also used a recent redesign of the Camry to introduce new features, including an updated version of the Entune infotainment system, onboard Wi-Fi hot spot, and Remote Connect, which allows the driver to remotely lock or unlock the doors, keep track of maintenance, and set parameters for “guest” drivers. Some of these features may eventually trickle down to the Corolla. 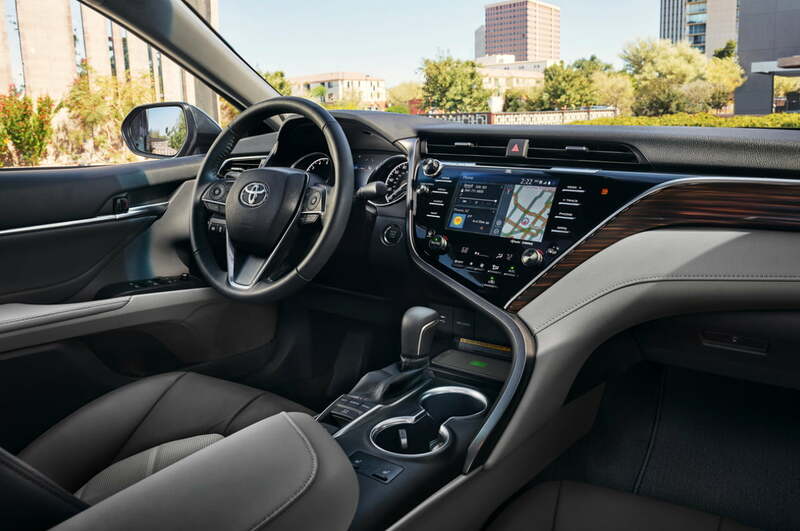 Both sedans are available with 7.0-inch central touchscreen displays and navigation, but Toyota also offers a 10.0-inch head-up display in the Camry, as well as a high-end JBL audio system with Sound Staging, which is meant to emulate a live concert venue. Neither car is available with Apple CarPlay or Android Auto, but both support Apple’s Siri Eyes Free voice-control system. The sole engine option for the Corolla is a 1.8-liter four-cylinder, which makes 132 horsepower and 128 pound-feet of torque in all trim levels except the LE Eco, which is rated at 140 hp and 126 lb-ft. All Corolla models are front-wheel drive, with six-speed manual or CVT automatic gearboxes. Available only with the CVT, the LE Eco is the most fuel-efficient Corolla, at an EPA-rated 34 mpg combined (30 mpg city, 40 mpg highway). Base models of the Corolla and Camry get a 1.8-liter and 2.5-liter four-cylinder engine, respectively. Toyota offers more options in the larger, pricier Camry. 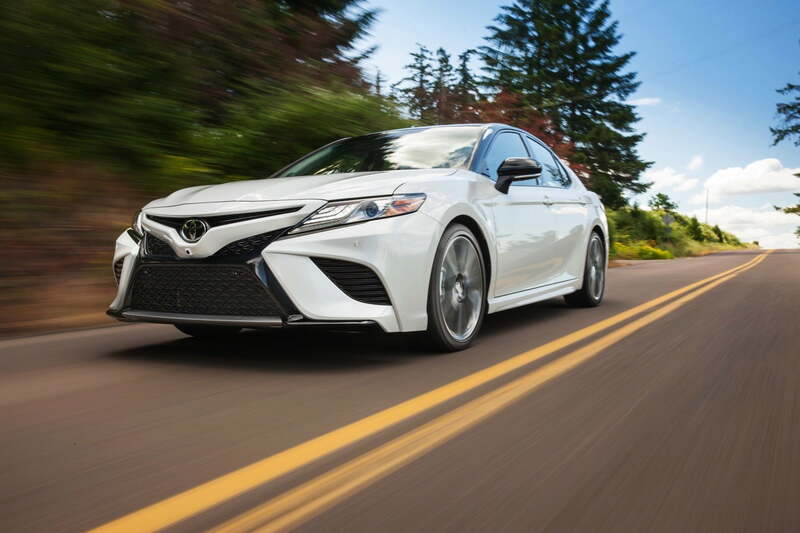 Base models get a 2.5-liter four-cylinder engine with the dramatic moniker “Dynamic Force.” It produces 203 hp and 184 lb-ft of torque in most trim levels, but gets bumped up to 206 hp and 186 lb-ft in the Camry XSE model. The Camry is also offered with a 3.5-liter V6, which churns out 301 hp and 267 lb-ft.
Like the Corolla, the Camry is front-wheel drive. An eight-speed automatic is the only transmission option. Not surprisingly, the four-cylinder trumps the V6 in fuel economy, achieving an EPA-rated 46 mpg combined (44 mpg city, 47 mpg highway) in XLE and SE models. The Camry is also available as a hybrid, pairing the 2.5-liter four-cylinder engine with electric assist. While it lacks a conventional transmission, Toyota gave the Camry Hybrid simulated “gearshifts” for a sportier feel, even adding paddle shifters to the SE model. Environmental protection Agency-rated fuel economy for the hybrid is 52 mpg combined (51 mpg city, 53 mpg highway). Neither car will win any beauty contests, but their faults are different. The Camry has a reputation for being bland and boring, so Toyota’s designers worked hard to make the redesigned 2018 model look exciting. However, they may have gone a bit too far, as the exterior design is a bit overwrought. The Corolla has the opposite problem. Its design isn’t very interesting or memorable. The Camry is based on the Toyota New Global Architecture (TNGA) platform, which is shared with the current-generation Prius. TNGA provides increased structural rigidity and, in the Camry, greater outward visibility and a lower center of gravity, according to Toyota. The Corolla is based on an older platform, but will likely switch to TNGA as part of an impending redesign. Interior designs are remarkably similar, given how different the exteriors look. The Camry essentially sports a more elaborate version of the Corolla layout. These two cars are made by the same company, after all, so some familial resemblance is expected. Both cars seat five, but the difference in exterior dimensions is reflected on the inside. A size comparison highlights the difference between the compact and midsize segments. 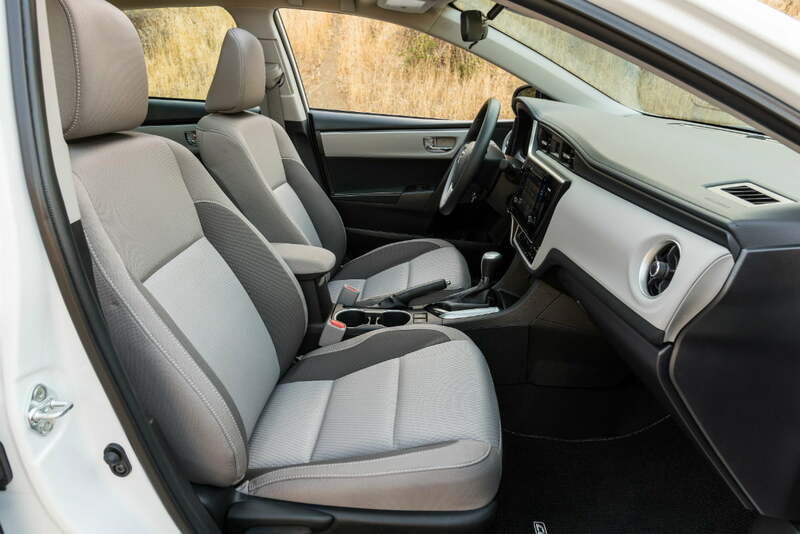 The compact Corolla measures 183.1 inches long, 69.9 inches wide, 57.3 inches tall, with a 106.3-inch wheelbase. The midsize Camry stretches to 192.7 inches in SE and XSE trims (192.1 inches in other trims), is 72.4 inches wide, and 56.9 inches tall, with a 111.2-inch wheelbase. The difference in exterior dimensions is reflected on the inside. 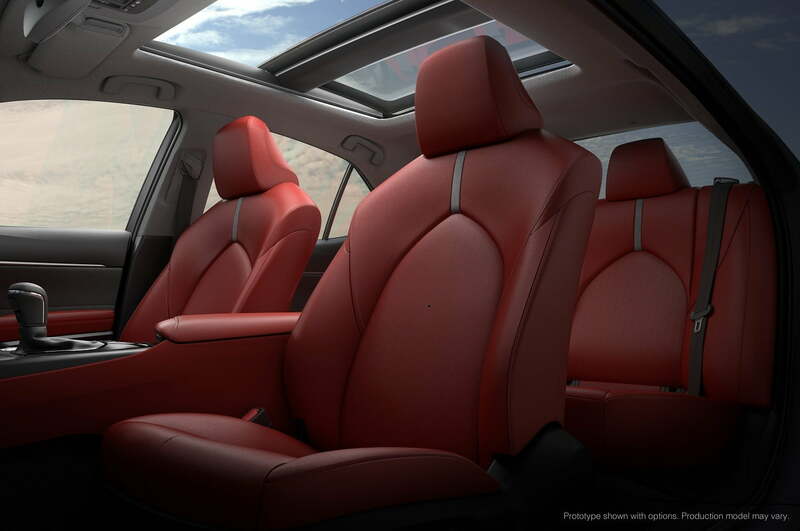 Both cars seat five, but the Corolla has 97.5 cubic feet (97.1 cubic feet with the optional moon roof) of total passenger volume, while the Camry has 100.4 cubic feet (99.3 cubic feet with a moon roof). The Camry also has 15.1 cubic feet of trunk space, compared to the Corolla’s 13.0 cubic feet. In addition to basic safety features like anti-lock brakes and traction control, both cars come standard with Toyota Safety Sense P, which bundles a pre-collision system, lane departure warning, automatic high beams, and adaptive cruise control. The Corolla sports 10 standard airbags, while the Camry has 10. Blind-spot monitoring with rear cross-traffic alert is available as an optional extra on the Camry. The Corolla starts at $18,600, which buys a base L model. Pricing moves up through the LE, LE Eco, and SE models to the top-of-the-line XSE, which starts at $22,780. That’s just below the $23,495 starting price of the base Camry L. In addition to the L, Toyota offers LE, XLE, SE, and XSE trim levels for the Camry. As with the Corolla, the XSE is the range topper, with the Camry version starting at $34,950. Both the Toyota Camry and Toyota Corolla have many rivals in their respective segments. In the compact segment, the Corolla faces off against the Honda Civic, Ford Focus, Chevrolet Cruze, Subaru Impreza, Volkswagen Jetta, Mazda 3, Nissan Sentra, Hyundai Elantra, and Kia Forte. The midsize Camry’s rivals include the Honda Accord, Ford Fusion, Chevrolet Malibu, Subaru Legacy, Volkswagen Passat, Mazda 6, Nissan Altima, Hyundai Sonata, and Kia Optima.